Conrad Motor Carriage Co. Lackawanna Motor Co. 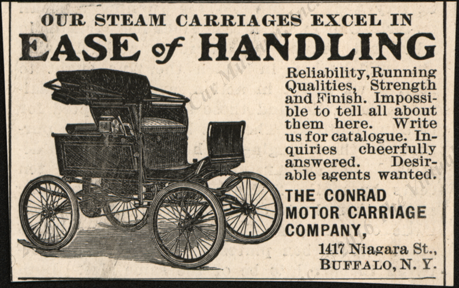 Unlike most minor steam car makers, there is a moderate amount of information about Conrad Motor Carriage Company. 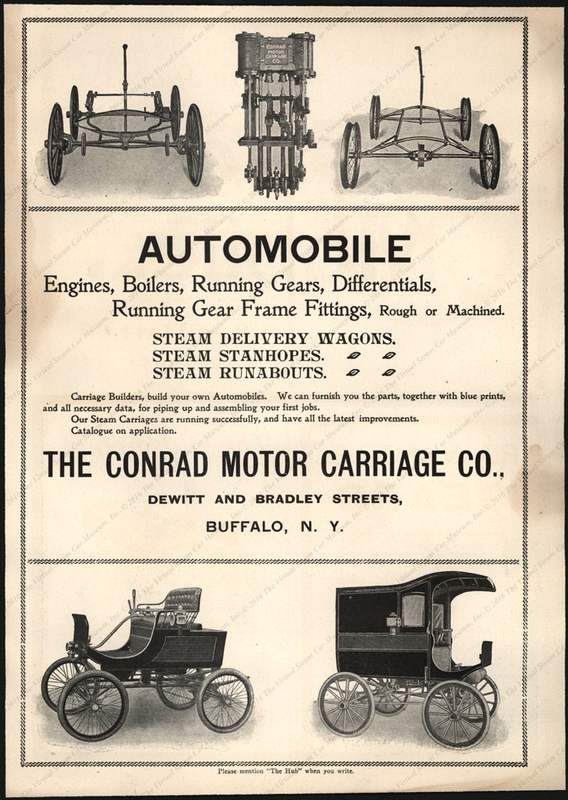 The Conrad Motor Carriage Company of Buffalo, NY was incorporated in April 1900 with a woefully inadequate capital stock of $25,000. 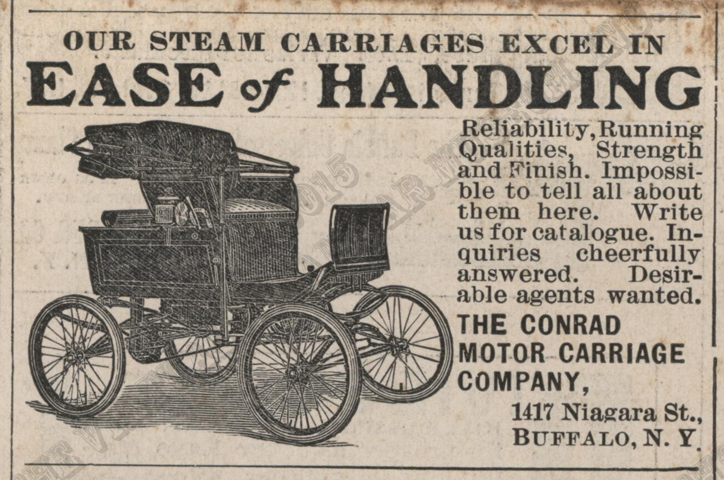 During Christmas 1901, a "large Conrad delivery wagon ran for a week making deliveries for a large Buffalo department Store. It did the work of three horse-drawn vehicles without trouble. A similar wagon carried mail from the main post office in Buffalo to the Pas American Exposition." 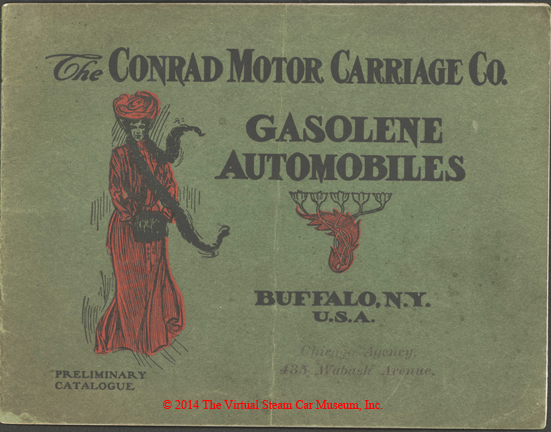 In 1902, the Conrad Motor Carriage Company began manufacturing gasoline cars. The company failed in July 1903 and declared bankruptcy in August 1903. Bently describes the technical details of the Conrad. The "1903 Steam Model 65 Special [was] powered by a two-cylinder, six hp engine located amidships under the frame and enclosed in a special hood. "A 20 in. boiler (at rear) produced super-heated steam from 650 copper tubes at 160 psi, water being stored in a 35 gallon tank. Eight gallons of gasoline fed the burner which had a patented pilot light to keep up a head of steam. Weight of this buggy was 1,004 pounds with a two-passenger panel back seat body and full tanks. One of four models (two of them commercial vehicles) with a price of $800 - $2,500." The 1903 Steam Model 65 Special was priced at $850. Conrad produced a Dos-a-Dos in 1902. John Conde dated this advertisement from Floyd Clymer as 1900, but it is likely 1902. Photocopy John A. Conde Collection. 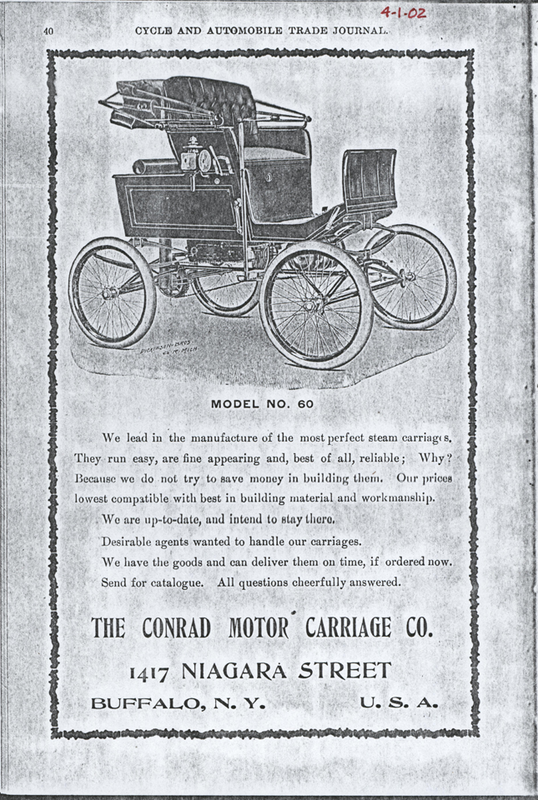 The Conrad Motor Carriage Company placed this full page advertisement in a 1901 issue of Carriage Monthly. 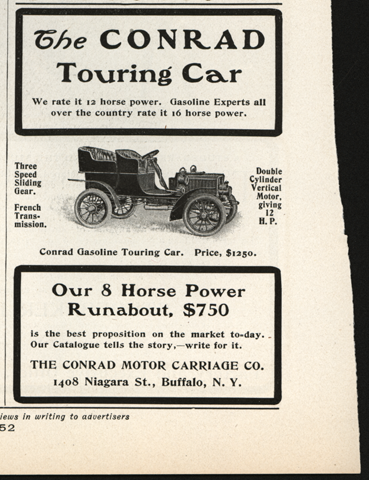 These four small advertisements appeared in unknown magazines in 1902. 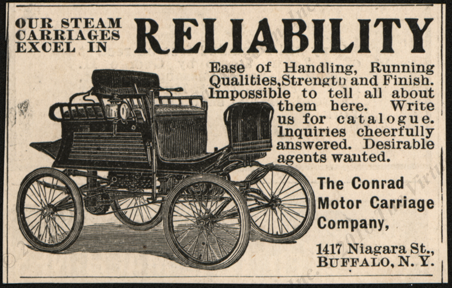 This full page advertisement appeared in the April 2, 1902 issue of Cycle and Automobile Trade Journal, page 40. This May 17, 1902 advertisement appeared in the Scientific American. 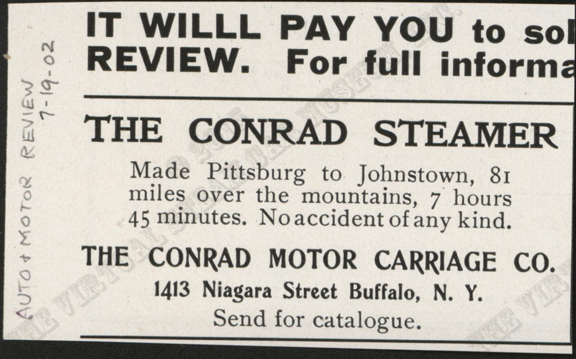 This July 19, 1902 advertisement in Automoblie and Motor Reviewpromoted the Conrad Steamer and its 81 miole trip over mountains between Pittsburg and Johnstown, PA. John A. Conde Collection. 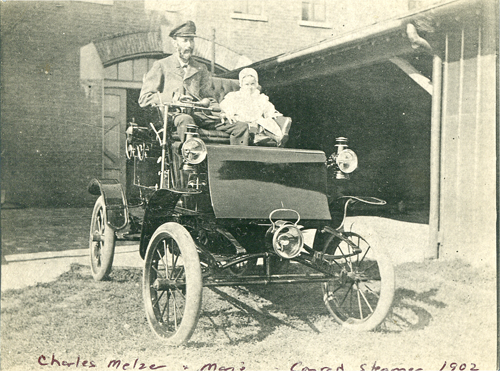 This 1902 photographs shows Charles Melzer and his daughter, Marie in the family's Conrad Steamer. Anonymous Source. This small advertisement appeared in the Scientific American of May 17, 1902, Vol. LXXXVI, No. 20, page 358. 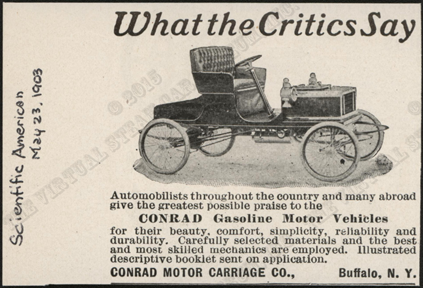 This full page Conrad advertisement came from The Hub of an unknown date, probably about 1902. 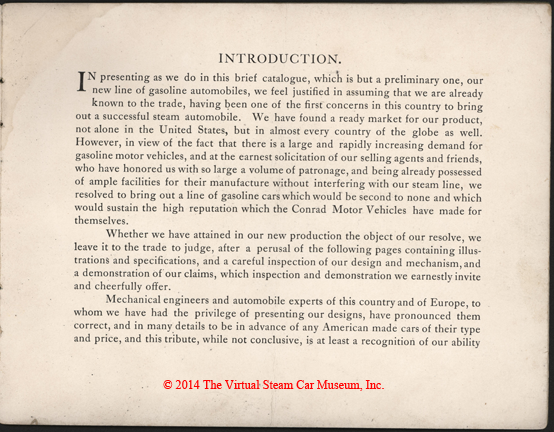 By late 1902, the company owners had seen the successful rise of gasoline automobiles and in 1903 added a line to its steam car line. The page 3 text is self explanatory. 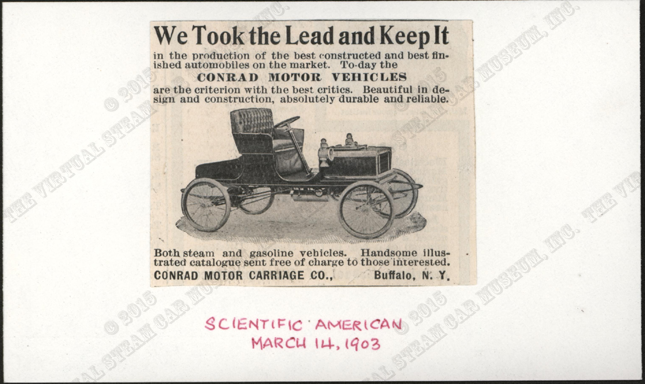 In early 1903, Conrad made the change from steam to gasoline. 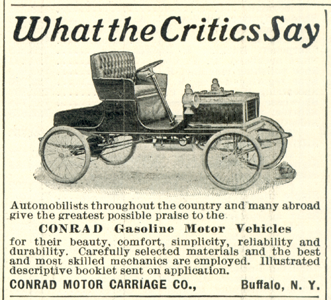 Following March 1903, only the Conrad gasoline cars were featured in its advertising. 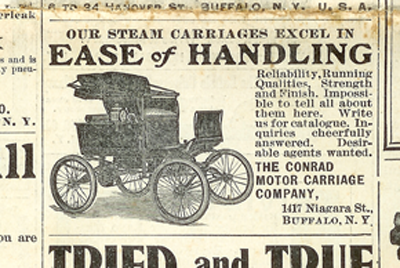 This January 1, 1903 advertisement promoted the Conrad Steam Car's Pennsylvania oddesy from PIttsburg to Johnstown. Photocopy. John A. Conde Collection. 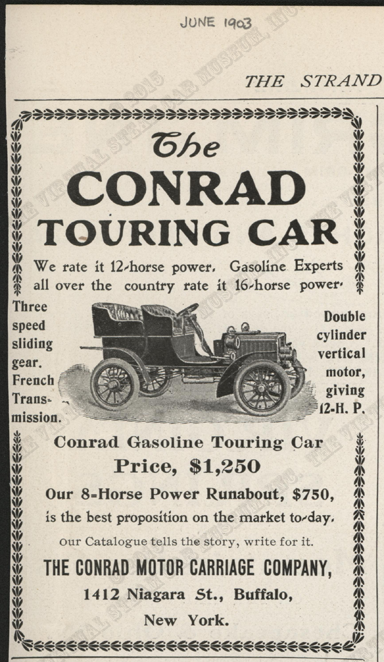 This 1903 advertisement for Conrad gasoline automobiles appeared in Scribner's Magazine, page 116. 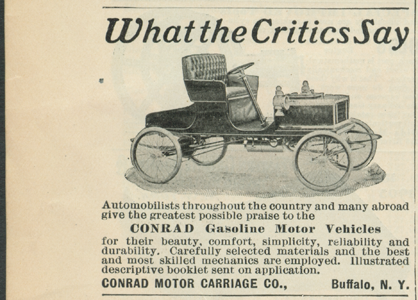 This 1903 advertisement for Conrad's gasoline automobiles appeared on page 52 of the American Monthly Review of Reviews. 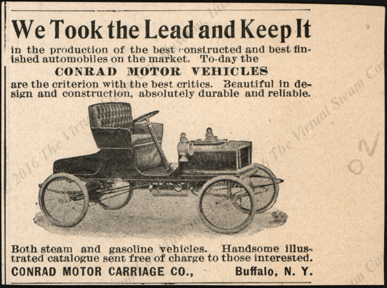 This January 24, 1903 advertisement in The Automobilepromoted the Conrad's gasoline powered automobile. Photocopy. John A. Conde Collection. John Conde copied this 1903 advertisement from Floyd Clymer. Photocopy. John A. Conde Collection. 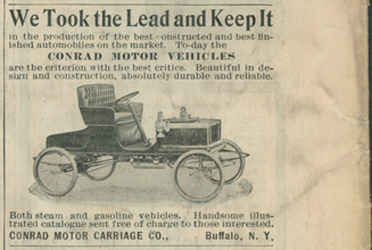 This February 19, 1903 article notes the appearance of the Conrad gasoline tonneau and the Conruad runabout with collapsible surry rear seat shown together at the New York Auto Show. Photocopy. John A. Conde Collection. 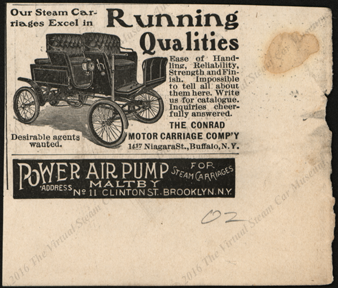 This March 5, 1903 advertisement in Motor Age makes no mention of steam powered automobiles. Photocopy. John A. Conde Collection. 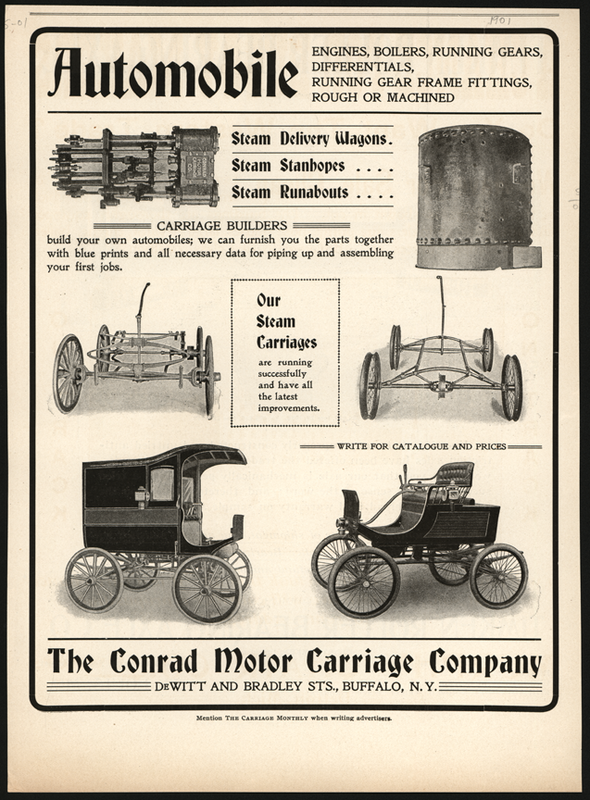 This March 14, 1903 advertisement in The Scientific American promoted the Conrad's steam and gasoline powered automobiles. John A. Conde Collection. This small advertisement appeared in the Scientific American of March 14, 1903, page 200. It is misdated as 1902. It is a 1903. These small advertisements appeared (right) in the Scientific American of May 23, 1903, page 404, and (left) in the Scientific American of March 28, 1903, page 233. 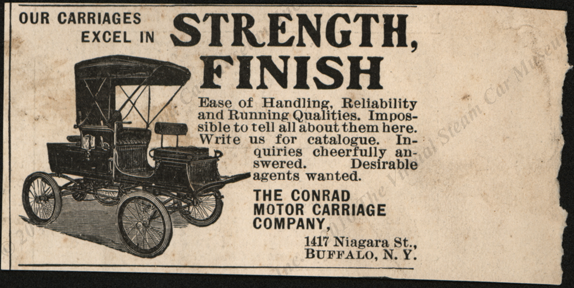 As early as March 1, 1903, Conrad shifted its advertising to gasoline powered Automobiles only. 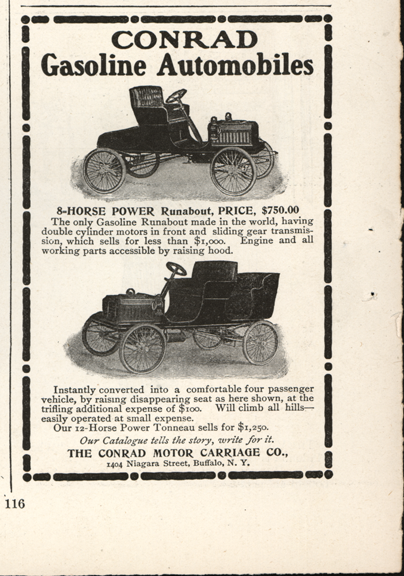 These two advertisements appeared in The Scientific American on May 23, 1903 promoting the Conrad Gasoline Motor Vehicles.John A. Conde Collection (on left). The Conrad Company placed this advertisement in The Strand for May 1903. John A. Conde Collection. The Conrad Company placed this advertisement in The Strand for June 1903. John A. Conde Collection. 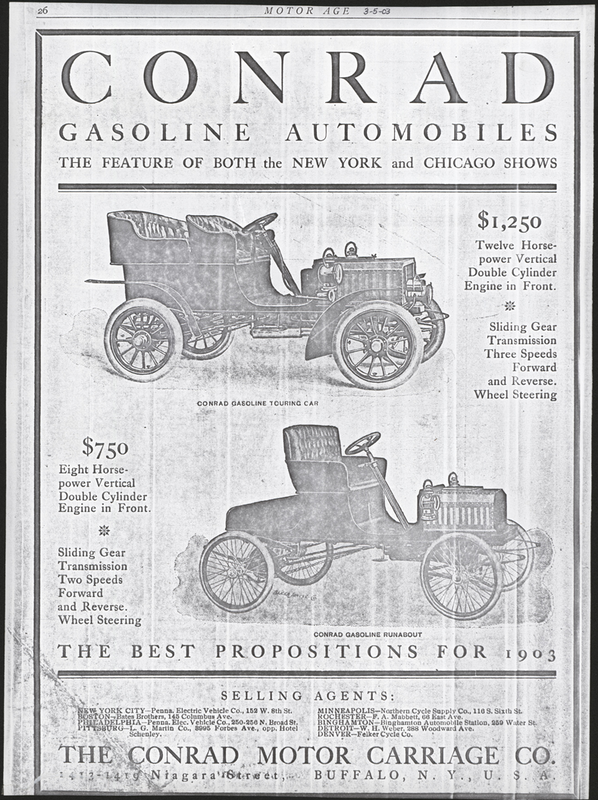 Floyd Clymer reproduced this page from trade magazine, likely Cycle and Autombile Trade Jouranal. Clymer dated the advertisement as 1903, but it is likely earlier. 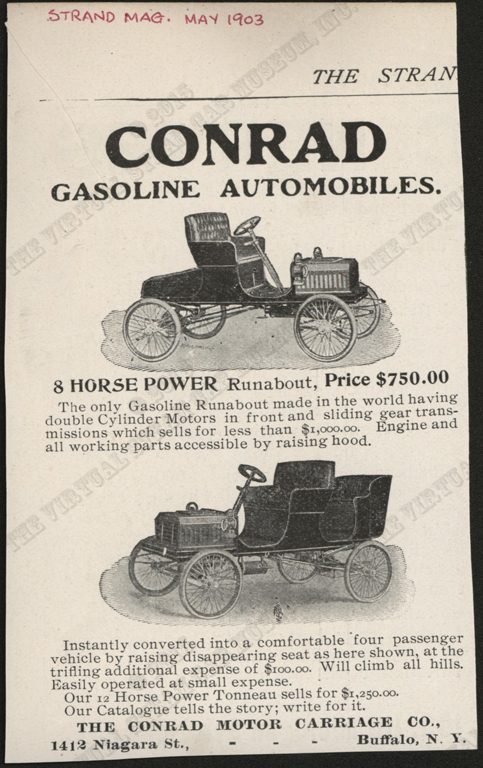 On March 2, 1904, W. J. Hayes, the Trustee in Bankruptcy, placed this advertisement in Horseless Age announcing the sale of the Conrad assets. John A. Conde Collection. 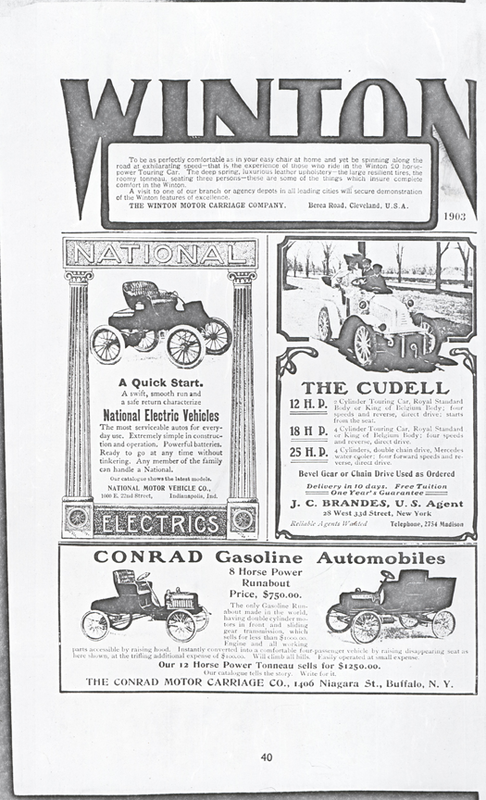 On February 1, 1905, W. J. Hayes was still advertising the Conrad assets in the Cycle and Automobile Trade Journal, p. 235. John A. Conde Collection. 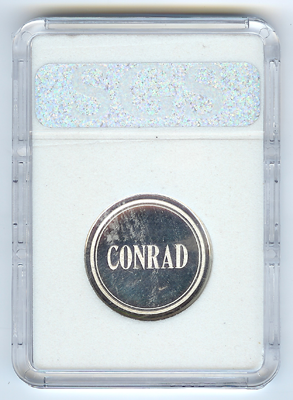 John Conde's Conrad File FolderJohn A. Conde Collection. 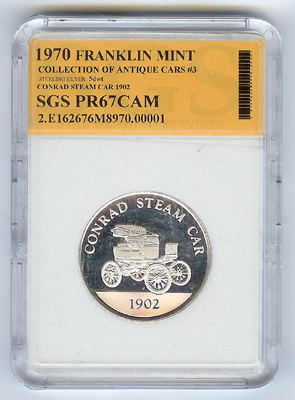 The Franklin Mint issued this Conrad Motor Carriage Company coin in 1970. Floyd Clymer's 1945 Steam Car Scrapbook lists three models of the Conrad in 1903. The Conrad Steam Model 65 Special: "Two-passenger; panel back seat; weight with tanks filled, 1,004 pounds; 2½-inch tires; 28-inch wheels; capacity of gasoline tanks, 8 gallons; capacity of water tanks, 35 gallons. Price $850." "Dos-a-Dos; stick back seat; seating capacity 4 passengers; weight, tanks filled, 1,000 pounds; 2½-inch tires; 28-inch wheels; capacity of gasoline tanks, 8 gallons; capacity of water tank, 38 gallons. Price, $800." Conrad Steam Model 77½: "Panel seat; seating capacity, 4 passengers; 3-inch tires; 28-inch wheels; gasoline tank capacity, 8 gallons; water tank capacity, 38 gallons. Price, 1,200." 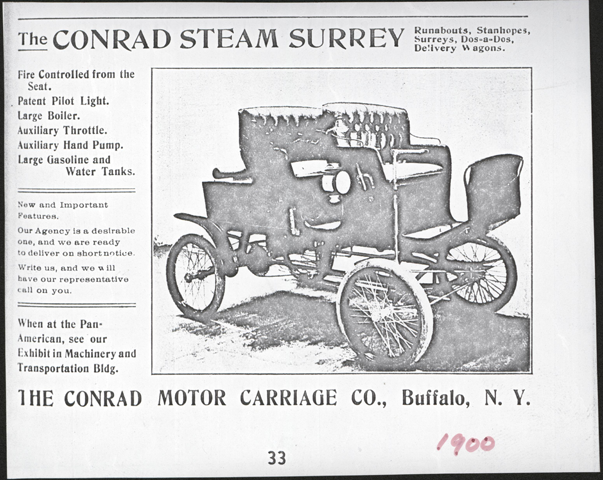 The Conrad Company made mainly steam cars, light 2-cylinder vehicles with side-tiller steering and single chain drive. In 1903 they introduced two gasoline engined cars of 8 hp and 12 hp, both with 2-cylinder engines, three speeds, and single chain drive. 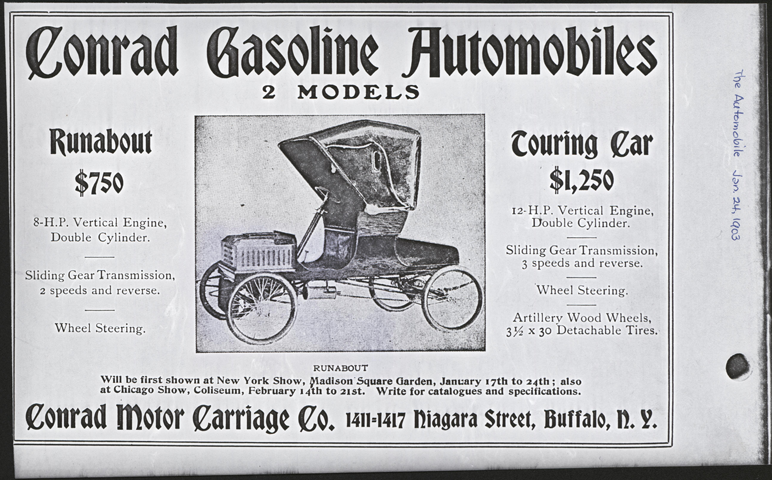 They [sic] were out of business by the end of 1903, but one of their gasoline engined models was exhibited by the Lackawanna Motor Co. at the 1904 New York Show. However, this latter company concentrated mainly on engines. SACA Forum , Phorum 5, It's Like Fast and Stuff. Posts by Don Anger David K. Nergaard March 2002. Bentley, John, Oldtime Steam Cars, (New York, NY, ARCO Publishing Co., second printing, 1969), p. 75. Derr, Thomas S., The Modern Steam Car and its Background: With a supplement on Historical Steam Cars by Floyd Clymer, (Los Angeles, CA., Floyd Clymer, 1952, 2nd reprint), p. 104. Clymer, Floyd, Floyd Clymer's Historical Motor Scapbook: Steam Car Edition, Vol. 1. (This book is copy No. 76692), (Los Angeles, CA, Clymer Motors, 1945), p. 49. This information seems to have been copied from some publication, but Clymer does not indicate where. Georgano, G. N., Encyclopedia of American Automobile, (New York, E. P. Dutton & Co., 1968), p. 48-49.